You're couponing like a pro! You've got a good start in January and you just need a few more savings tips to help you reach your goals. Keep redeeming your coupons and doing your matches each week. Let's expand your savings beyond your coupons to give you just a bit more. Here are 9 more ways to save while shopping. Open up your cabinets. Check out all the items you have already and plan your meals with just a few add in ingredients. Sometimes you'll find a couple tins of tuna pushed to the back, or a stray can of green beans. Plan your means with what you already have. After you have inventoried your cabinets and fridge, go ahead and finish your weekly meal planning. Make a full list and stick to it. Be sure to include all the meals you plan to prepare, and do not include meals you are not planning. For example, I do not fix a meal on Mondays. We have dance class and hectic schedules so we have left overs from the weekend on Monday nights. Here's an easy one. Leave the kids at home when doing your shopping. they tend to want more items not on your list and distract you from making good comparison shopping. Prepare your own foods. Shortcuts are convenient, but do cost you more. Do you really need to pre cut celery? Can't you cut the ends in less than 5 seconds? It's the same for Cooking sauces, blended spices, or pre packaged roast kits. You cand save yourself a bundle if you plan to just do a bit of your own preparations. Review the store brands. Oftentimes, grocery stores will sell generic brands or store-brand versions to your favorite brand goods, and they will be much cheaper. County Maret has plenty of store brand options. We even have our own line of organics called Wild Harvest. Take advantage of the frozen foods sales. You can find some great deals that will easily keep for the next 13 weeks. When you see a good sale in frozen that matches your meal plan stock up. The week to week usage of these goods at a discount will lower your grocery bill for weeks to come. That leads to saving up on seasonal produce. If grapes are on sale this week, and apples are sky high, it might be time to buy grapes for fresh and healthy fruit this week. Keep an eye on the produce section of your budget and what seasonal produce is coming up on sale next. Start a price comparison notebook for items you buy on a regular basis. Can you try a different brand? What about comparison shopping sizes? Can you purchase a larger package and split it for less? Does it compromise freshness or quality? Comparison shopping is a tactic that will save you money in future weeks. 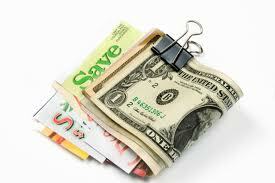 Expand your coupon savings to all household goods. Include regular household items like trash bags, tooth paste, laundry detergent etc. Then take a look at your occasional household items like softener salt, cleaning supplies, or even movie rentals. Use coupons for every item you buy for the home.